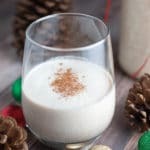 A traditional Puerto Rican Christmas cocktail that's creamy and coconut flavored. Combine egg yolks and evaporated milk in a sauce pot over low heat. Stir constantly until the mixture reaches a temperature of 160 degrees F.
Pour the mixture to a blender, and add the remaining ingredients. Blend for about 30 seconds. Pour into mason jars or empty wine bottles and chill in the refrigerator for at least four hours.